A joke that would be funny enough to laugh at if it wasn’t so serious. A prime minister who has made an art out of lying through his teeth. 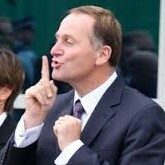 Key Says Shhhh, don’t tell the Kiwis! Tens of thousands homeless. Hundreds sleeping in cars, thousands sleeping on the street, in garages, sheds, at Maraes, or just wherever they can. The response of the Prime Minister John Key, known to enjoy fondling the hair of little girls who make the mistake of getting to close to him, is tolie and say “they don’t want any help”. New Zealand is headed for a human disaster akin to a small Third World Country. Soon people will be dying in parks, in cars, in corners of the streets from the cold and wet Winter. Key of course won’t care and probably say ‘they wanted to die’. Decent New Zealanders should not allow this any more, we need to act as one, we need the Media to do their job and run a relentless campaign to rid the Liar that is our Prime Minister from our Government. It is now beyond just letting him keep on with the heartless lies, and the incompetence that has led to this growing disaster. An immediate stop to all immigration until house prices level out and we no longer have people homeless who need and want homes. Housing New Zealand needs to purchase (not sell!) thousands of homes, no matter the cost, and house those who have no suitable accommodation. The long term savings in social costs, along with the affordable rent that could be charged will more than prove financially affordable. That’s it, it is as simple as that to solve our current impending human tragedy. Yet Key will not do this because he relies on Immigrants for votes, which they gladly give his Government because they allow them to buy our houses and businesses. He also will not allow housing to be bought by Housing NZ, because he simply doesn’t care about anyone who is not filthy rich like him and his crooked tax evading corporate mates. John Key, Paula Bennett, and the rest of the National Government, you are a disgrace! Don’t you dare call yourselves Kiwis, as Kiwis care about each other. Your supporters are also a disgrace and deserve to also be treated as Non-Kiwis, Hateful Non-Kiwis who should be ashamed of their heartless disgraceful allegiance to Scum like Key and Bennett. Two prime examples are the second rate sleazy TV hosts Mike Hoskings and Paul Henry who if physically possible would have Key’s babies! Do something decent Kiwis! Do something Media! Write, phone, email your MPs, daily if you can. Quote this article, demand they do what we ask! News Media you should be harassing Key and his incompetent dishonest Ministers every day, demanding action, demanding the truth, demanding action. Don’t sit back anymore and just watch our fellow New Zealanders die, all to please some filthy rich new immigrants who want our houses so they can make some money selling them back to us in a few months or years time! This one is getting worse I’m afraid.